At Prewitt, he was chief project engineer for working on a "Rotachute" delivery system for airdrops. He later went on to serve with American Helicopter on the XH-26 “Jet Jeep” program (see Vertiflite, Spring 2009), and Bruno Nagler’s NH-160 tip-jet powered project. He also worked with synchropter pioneer Anton Flettner. He began his own helicopter consulting firm to aid those designers operating without support from government or the corporate giants of the aviation community. In 1998, Liberatore published Helicopters Before Helicopters (Krieger), which documented and analyzed rotary wing concepts and experiments before the twentieth century, as well as American helicopter projects that predated Sikorsky’s VS-300, based on some of the historical volumes of the Handbooks. He contributed 11 articles to Vertiflite between 1952 and 2009. Liberatore joined AHS in 1948 and was an Emeritus Member, and a member of the President’s Club. In 2004, he was named as the first recipient of the AHS John J. Schneider Historical Achievement Award. 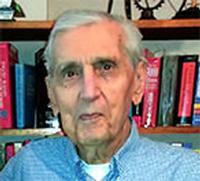 Liberatore passed away on May 23, 2014, he was 94.